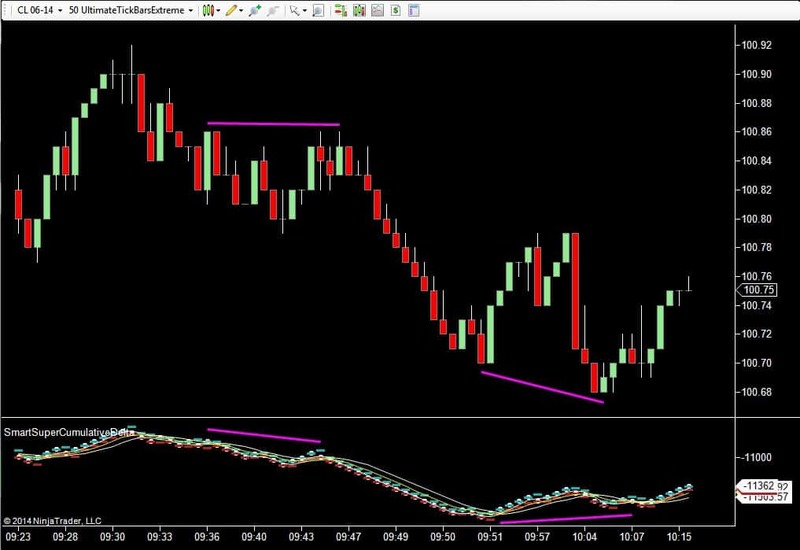 How you organize information is key to making good trading decisions. It is well known that analyzing market delta can be an edge trading. Delta is simply the degree to which one side, long traders vs. short traders are overwhelming the other. What you are doing is looking for is where these two groups are different and this difference is called delta; a fancy name for a fairly simple concept. When markets are out of balance, they move. So, you want to be long the market when buyers are overwhelming sellers and short the market when sellers are overwhelming buyers. There are a couple ways delta is typically presented for traders. One is the raw form which is simply a delta plot. This will show you which side is in control on a bar by bar basis (to view charts larger than shown, click them and press the ESC key to return). Next is the Cumulative Delta. 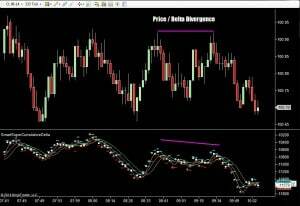 This method keeps a running total and more easily shows you how the ongoing Delta relates to price movement over any given number of bars. There are various techniques that can be used. 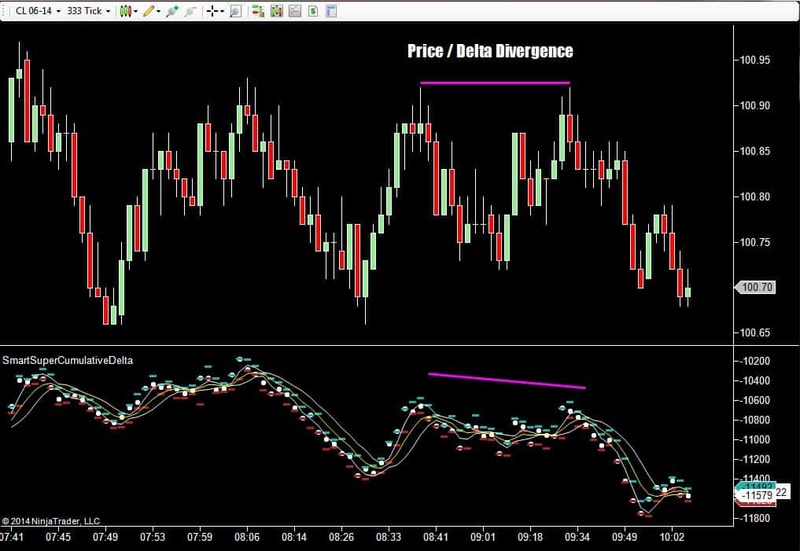 One example is to identify divergence between a cumulative delta plot and pricing as also seen above. Counter trend type divergences are often the most reliable for this technique but there is a certain type of with trend divergence that can also be excellent as is shown in the first divergence on the last chart in this article (Also see the Smart Delta Divergence Package for tools that help identify these kinds of relationships). 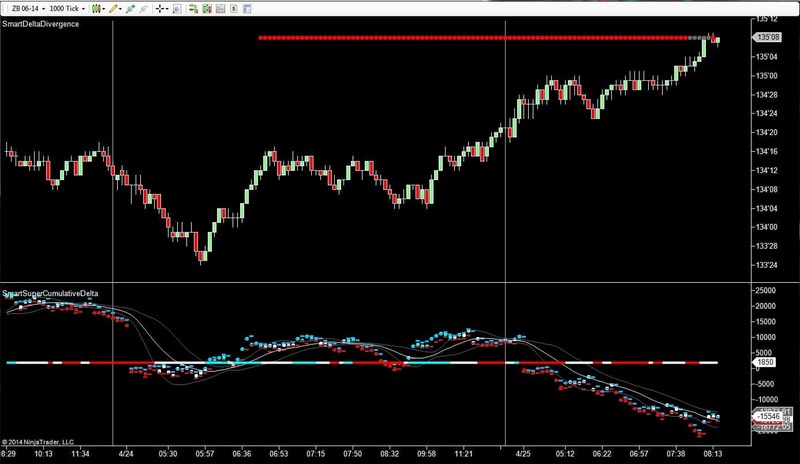 Here we see a strong price delta divergence where price is rising against the declining overall Market Cumulative Delta as shown on the SmartDeltaDivergence Indicator's red dots (behind the current price on the chart). You cannot see this kind of relationship just by looking at a chart without these tools and the above chart is clearly not exhibiting a healthy up trend at this time. These tools are great and they serve their purpose but what if we were able to organize the entire chart by Market Delta? This brings us to the Ultimate Tick Bar (patent pending). 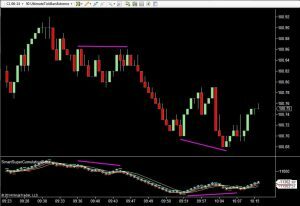 The Ultimate Tick Bar (aka UTB) is a true Market Delta and Order Flow Bar. Organizing charts by Market Delta instead of by traditional means such as tick, volume, range and time based charts basically enables you to see the order flow right on your chart without any other indicators. Several characteristics become immediately evident when you do this. One, bars tend to close at their highs or lows. This is true because the bars themselves represent buying or selling pressure. So, they close at their high or low about 80% of the time, and about 64% of the time in any given cycle on your chart (time based bars do this about 12% of the time and tick and volume bars about 30% of the time). This is a significant factor with UTBs because this orientation makes your indicators faster than your competitors. This might also be true of range type price bars, but it is only partially true because range based bars allow expansion without regard to underlying volume activity. 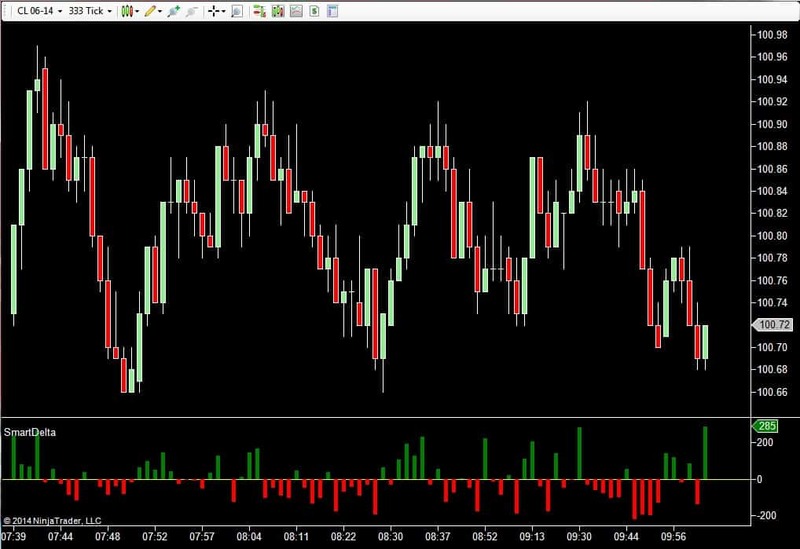 In the above chart we see that a Market Delta plot as seen by the SmartDelta tool every bar is either plus or minus 50 upon completion of the bar. This is true because the UTB is a true market Delta Bar. Because of this a Market Delta plot becomes a bar counter and can help us to estimate when a bar will complete and a new bar will commence. When we organize the bars on our charts according to Market Delta, it also means everything is equally incremented by net buying and selling. In the next chart we can see the SmartCumulativeDelta showing us divergence in two cases. Plotting a Cumulative Delta in this way with the UTBars is the cleanest and purest form of delta divergence analysis because it causes the visible divergence to be much smoother and clearer to read than it would be with any other bar type. Another characteristic of an Ultimate Tick Bar is where bars overwhelm previous bars, it literally tells you the delta equation. So, if you have a UTB that encompasses say, 2 other bars, you know you have a 2:1 ratio where the selected delta for the bar has overwhelmed other traders orders. It might translate into a sentence like, "125 Net Ticks or Market Delta have overwhelmed 375." This, of course, is a form of built in supply and demand analysis that you can learn to see right on your charts without any indicators; just the bars. Similarly when you get an inside bar (where the open and close are within the range of the last bar), this tells you to use caution about entry. Why? Because UTBs are a true trend oriented bar due to the fact their construction is driven by buying and selling pressure within the bar. There are many other techniques that can be used with these bars and IndicatorSmart has developed various other tools and resources that support the way UTBs work such as the SmartSuperTrend and many others. To get started learning more about UTBs and related tools, Click Here. « Bloodhound Packages	» What is so Smart About Smart Super Trend?